Durban - As part of its tenth anniversary celebrations, the sport-crazy 'herd' of The Cows has turned it's attention to a debut at the FNB Dusi Canoe Marathon that starts on Thursday morning, sharing their fundraising drive with their principle charity and with the race's beneficiary. Pinetown businessman Gordon Reid, who has been driving force behind the distinctive presence of The Cows at major events like the aQuellé Midmar Mile, the 947 Cycle Challenge, the Tour Durban, the Comrades Marathon and many other mass participation events, is set to make his Dusi debut, and hopes to start a new 'paddling herd' of Dusi participants. Reid has signed up 18-Dusi veteran Brett Challenor as his partner for the three day, 120km adventure from Pietermaritzburg to Durban, but still admits that he is a bundle of nerves. "It's pretty terrifying!" said Reid. "I have always wanted to a Dusi, and I respect the race as a proper challenge, and it looks like this year's Dusi is the one to do because every paddler is going to have to work really hard for their medal." "As The Cows we take part in all these great events as a way to raise funds and awareness for the Childhood Cancer Foundation CHOC," explained Reid. "However, through their Charity Batch the FNB Dusi raises funds for their own projects, and we want to support the vital work that the Dusi uMngeni Conservation Trust (DUCT) does by sharing whatever we earn by paddling the race between CHOC and DUCT." Reid and Challenor will be joined by at least two other crews paddling in the distinctive black and white cowhide rashvests, while their kayak will also be decorated in the black and white pattern that is the hallmark of The Cows. "This is an iconic South African event, and a quintessential African adventure," said Reid of his Dusi debut. "Our rationale at The Cows is "Love Living Life" and we are a festive bunch of men and women who channel our passion for these great events into improving the lives of young boys and girls who are battling cancer. To date The Cows have raised over R25 million through pledges and sponsorship while they take part in these sporting events. 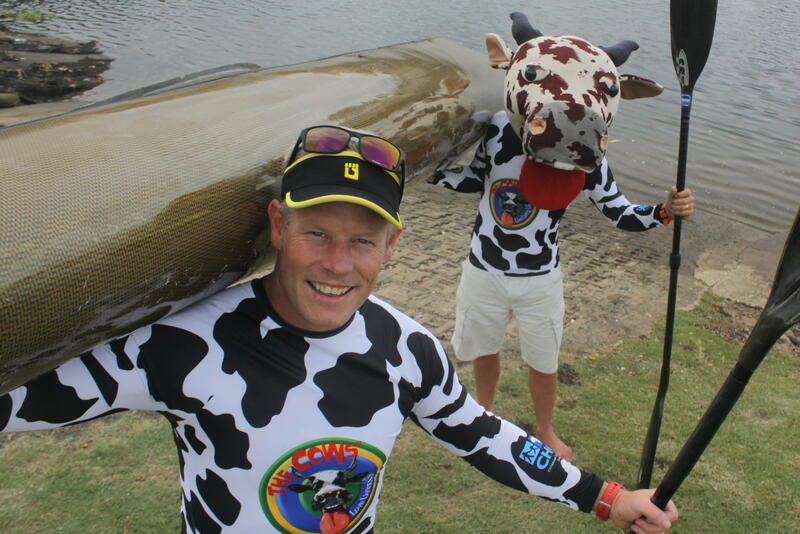 Reid said he was hoping to use the profile of the FNB Dusi as a springboard to start a permanent paddling "herd" of The Cows that could add it's weight to the national fundraising drive by taking part in all the major events on the national canoeing calendar. "First things first, I just need to get to Durban in one piece on Saturday!" said Reid.